Claim the Refund Online in 3 simple steps. We Make it Faster and Simpler! Over Paid or Low Mileage or Sold/Destroyed credits. IRS Tax Form 8849 is used to Claim Refund on Federal Excise Taxes paid by attaching Schedules 1, 2, 3, 5, and 8 based on the type of claim and purpose of claim, precisely the fuel tax refund claims. Form 8849 is particularly used to make a refund claim and not to make any adjustments to liabilities reported on any of the Excise Tax Forms. Most taxpayers file a refund claim if they owe it from the IRS on the federal excise taxes that have been paid; could be a refund from an overpayment of tax than the liabilities or claim on a heavy vehicle use tax. You must file your return to claim the difference that you owe back from the IRS. How to file Form 8849? Refund claim Form 8849 can be filed manually as a paper return or electronically through internet by accessing commercial tax software products like TaxExcise.com by paying a minimal service fee. E-file is astonishingly FAST and ACCURATE, reaches IRS in just a few minutes. Who must file Form 8849? Any taxpayer who owe a refund for the federal excise taxes paid can claim a refund by reporting IRS Form 8849 by attaching a right Schedule. Form 8849 refund claims can be made online or electronically to expedite the claim process. How long it takes to get refunds? Refunds for an electronically filed Form 8849, with Schedule 2, 3 or 8, will be processed within 20 days of acceptance by the IRS. All other Form 8849 schedules like 1, 5 or 6, will be processed within 45 days of acceptance. Add your complete physical address of your business, Employer Identification Number (EIN) and the tax refund related information. Choose the tax refund claim form, schedule, filing period and the filing quarter. Start entering your claim related information, review the return in the consolidated summary. Choose e-file, pay the processing fee with your credit/debit card and submit your Federal Excise Tax Refund Claims return for processing. IRS acknowledgement would be sent to your registered email inbox. If you have subscribed for Text Alert, message will be shared to the cell number. 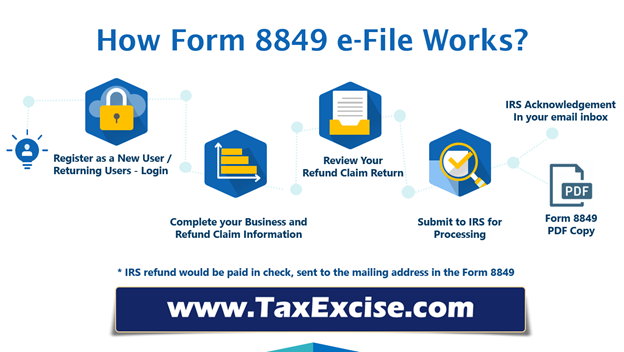 You may print a copy of your Form 8849 PDF any time by accessing your user account. Efiling or electronic filing is submitting your federal excise tax refund claim returns online to the IRS directly from TaxExcise.com website. There are two ways to filing your federal excise tax refund claims. The traditional way is the offline way, where you manually fill in directly or through a tax preparer you file your returns. The other way is when you e-file through the internet. E-filing has become popular because it is easier, doesn’t require prints of documents, and can be done in less time. Fastest refund guaranteed! TaxExcise.com a product of ThinkTrade Inc. and our web tax products helps excise tax payers of US get the most contented experience of filing their federal tax returns online in a timely, fast and accurate style. Built upon considerations for taxpayers’ comfort ruling out paper filing hardships. ThinkTrade Inc’s tax solutions have become well established trusted e-file resources from 2007. An early day IRS authorized e-file provider for tax products, ThinkTrade has so far succeeded with thousands of e-filers, volumes of accepted returns and that many smiles. A BBB accredited business with A+ rating has been rated #1 by the Excise Taxpayers. Always worked in enhancing the filing experience of the tax payers and set a bench mark in the efiling services. Think Trade, Inc. and TaxExcise.com is the most trusted online platform, one stop website for your Federal Excise Tax Needs. Tax8849.com is an extended website of TaxExcise.com, an IRS Authorized e-file provider since 2007 to e-file Quarterly Federal Excise Tax returns. Owned & operated by ThinkTrade, Inc.